Just a couple of months ago a friend and I were discussing what horrible role models the older Disney films provide girls: Snow White, Minnie Mouse, The Little Mermaid. Always a princess waiting for a man to wake her up, untie her from the train tracks, or give her a voice. 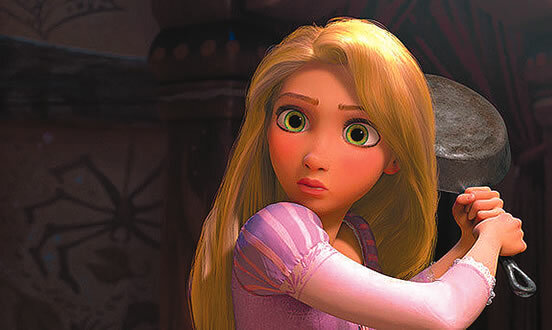 Watching the trailer for Disney’s new animated adventure “Tangled,” filled me with hope. Was this going to be the break-out fairy tale that gave Disney women their independence? Would Rapunzel have the free-spirited, go-get-em nature of a Pippi Longstocking? Was Disney finally getting there? Were they at last going to offer us a woman who wasn’t a bone-thin, pale, shell-of-a-person, waiting around for her prince? Though Rapunzel is certainly sassier than your average cartoon heroine, gender stereotyping lives on in the film in many subtle ways, just under the surface enough to seem harmless and almost quaint. Perhaps the same way that it lives on in our society? From the frying pan she uses to defend herself, to her purpley-pink outfit, she is one hundred percent quintessential princess. What really intrigued me though was one scene in particular. Rapunzel and her love interest, Finn, are in a sticky situation, threatened by a gaggle of angry-looking men. It seems as though they’re toast… that is until Rapunzel decides to appeal to their humanity. She explains that they’re on their way to see the lights in the sky, a lifelong dream she’s held dear. “Haven’t you ever had a dream?” she asks them. At which point, in true Disney fashion, the big scary tough men begin to sing about their dreams of becoming concert pianists and mimes and whatnot. Beyond the suspension of disbelief this plot twist required, it got me to thinking about how we see women as leaders. We assume that they hold this innate “talk it out” mentality that supersedes any urge to fight or make war. Now that we have some examples of how women govern – granted, they still make up only 17% of congress and have yet to occupy the position of highest power – are they living out this idea we have of women as peacemakers? Upon further investigation I found that, though a majority of women in the house of representatives voted against the Iraq resolution, 78% of female senators voted for the war, an even greater percentage than that of their male counterparts. I realize that the reasoning behind a legislator’s vote can have a great deal to do with power dynamics and politicking, but I still think that these statistics call into question this notion we have. We think of women as meek and accommodating, but does this hold true when we look at the way that women are governing? The end of the movie had me excited, as Finn filled the audience in on what happened after the classic Disney happy ending. “I know you’re all wondering if we got hitched. It took her two years to pop the question…” The line turns out to be a “joke”: “Just kidding. I asked her,” Finn concedes. Maybe once we have a first man in the White House, a Disney Princess proposing to the man of her dreams won’t seem so preposterous? Though I’m still waiting for the Disney heroine who wields a pistol and passes up a love interest in favor of greater adventures, Rapunzel is at least a step in the right direction.